This corner unit nestled on the north end of the building is ideal if you’re seeking peaceful and private vacation rentals in Sanibel Harbour. The highlight of this unit is the extraordinary gulf and bay view from the large wrap around screened-in balcony - one of the best views of all our Sanibel Harbour condominiums. The kitchen was completely renovated in the fall of 2013, so everything is brand new, with a designer's touch. The master bathroom and bedroom were also completely renovated in 2012, including a walk-in shower with a built-in seat for your comfort! The unit has an upgraded vanity and washer/dryer, and an expansive walk-in closet offering plenty of space for longer vacations. When you prefer to enjoy the view from indoors, the sectional sofa in the living room looks out onto the sparkling bay waters. Both the master bedroom and the guest bedroom have king sized mattresses for a comfortable night's sleep. This rental provides great value to anyone looking to vacation in South Florida! You may have found this rental on HomeAway 4363823, HA ID 4363823, VRBO 4363823ha, or Vacation Rentals 4363823. Our first visit to the Ft. Myers/Sanibel area was fantastic. 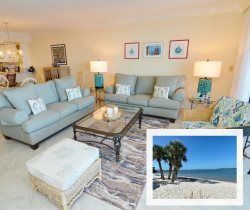 Excellent central location to all areas - getting to Sanibel is especially a breeze as you exit the property right on to the entrance of the Sanibel Causeway! Our family will definetely stay at this location again. Our kids loved the private little beach and the large and secure pool area. The condo towers are right on the water & the views of the waterway and surrounding islands were awesome! We heard the waves daily and even saw a pod of dolphins swim by. Great amenities, Great staff, Great location and Great bargain. Thank you again!